An excavated path leads to the next room. Where there are two stone pillars in the relatively large cavern, along with excavation scaffolding that you descend. The shorter of the two has a respawning Dwarven dagger, a blacksmith's draught, and a piece of bent Dwemer scrap metal on it. You can jump down on to it from the ledge near the cart. There is a small unlocked chest at the top of this room to the right of the crumbled door which can be reached using Whirlwind Sprint dragon shout or with clever jumping to access. At the bottom of the room are some bones and several food barrels. At the top of a wooden ramp, by three of the barrels is an iron ore vein and a second vein found on the western wall. When you enter this area, there is an alcove on either side, past this the passage turns left then right before climbing a ramp. At the bottom is a pressure plate that triggers a poison dart trap fired from both sides. At the top is a Falmer you can see and another further back to the right that is hidden from view. At the top the passage turns left and extends away in front of you, partway along is another pressure plate that triggers a spear trap from above and at the far end are two more Falmer. On the left, near the Falmers is a stone table with an apothecary's satchel, a random greatsword, and various metal items on top and an unlocked chest beside it. The passage turns left here, ahead is the body of Staubin, the last of the mages on the expedition, with his diary. Beyond his body the passage opens out into a large room containing a Dwarven spider. There are stairs to the east that lead up. 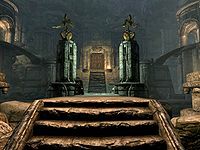 As you start to climb several Dwarven automatons will appear from scuttles both ahead and at the bottom of the stairs. Once they have been dealt with continue climbing counter-clockwise, you will eventually find a Falmer fighting a Dwarven sphere. Wait for the Sphere to kill the Falmer, then take on the sphere alone. 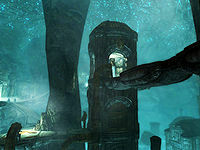 In the southeast corner, the room continues through a gap in some metal grating and another area, with a short flight of stairs opposite, keep continuing around to a table with a Falmer bow, two Falmer arrows, a leveled potion of healing and a lever that re-activates the automated defenses, opens a gate behind you and updates the quest. To the right is an unlocked chest. Through the open gate is a walkway with another unlocked chest at the end. This walkway is directly above the first passage in this zone, when ready simply drop down and exit through the door you initially entered through. This page was last modified on 9 November 2017, at 21:53.